You may think your blood pressure is only important to your general health — but it can also affect your dental care. That’s why it’s increasingly common for dental providers to include blood pressure monitoring for patients during routine visits. High blood pressure is a risk factor for several major health conditions including heart attack, stroke and diabetes, and is one of the most common diagnoses in the United States. 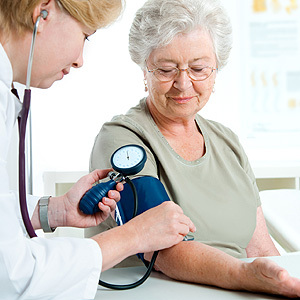 Even so, many people don’t know their blood pressure is abnormally high. It may be discovered during an annual health visit, or not at all. Since many people visit their dentist twice a year for cleanings, taking a blood pressure reading during these visits increases the chance of detecting a high pressure. In one study published in the Journal of the American Dental Association, the researchers looked at dental patients who had not seen a doctor in the previous twelve months and who underwent blood pressure screening during a regular dental visit. Seventeen percent of those studied learned they were at increased risk for cardiovascular disease. High blood pressure can also have a direct effect on how we treat your teeth and gums. For example, we may have to adapt and become more diligent about preventing dental disease if you’re taking a blood pressure drug that could trigger reduced saliva flow (dry mouth), a factor in tooth decay. Certain local anesthetics may also contain substances like epinephrine that constrict blood vessels, which can increase blood pressure. To avoid this if you’re hypertensive, we may need to adjust the dosage of anesthetic drugs to lessen this effect. Monitoring blood pressure in the dental office is a good example of how all healthcare services can interact with each other. At the very least, a blood pressure check at your next cleaning could alert you to a potentially dangerous condition you didn’t even know you had.